"What a great site! Thanks very much." 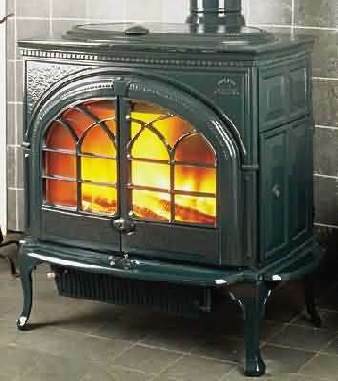 When you go shopping for a wood stove you will have two main sources of information to help with your decision. First is the manufacturer’s literature that gives performance specifications, and second is the advice you receive from the various stove dealers you visit. Speaking of dealers, you might think a dealer just wants as much of your money as possible, and there is some truth to that of course, but the reality is more complex. The experienced dealer wants you to be so happy with your purchase that you will tell your friends so they will buy too. That means the good dealer will make every effort to meet your objectives with the right stove because no dealer wants you to come back complaining that the stove is to big, too small, or otherwise unsuitable. A good dealer can be your most valuable resource. 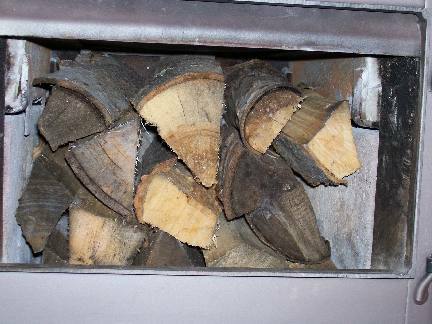 Beware of dealers who don’t heat their own houses with wood and don’t have operating wood stoves in their showrooms – their advice is not worth much and may be worse than nothing. Hint: the staff of big box stores don't usually know much about wood heating products, so be skeptical of any advice you receive from them. Once you collect a few stove brochures you’ll notice the standard pieces of information that are provided and some of these can help you with your purchase decision. The two main material options are cast iron or welded steel. There is no heating performance difference between them so the decision has to do with aesthetics and price. Graceful curves and artistic relief patterns make cast iron stoves pleasing to the eye, rather like fine furniture for home heating. You’ll pay a premium price, though, and cast stoves do need to be rebuilt every few years to seal the joints between panels so that air leakage will not allow the fire to burn out of control. Welded steel stoves are plainer, but cost less. In terms of durability, there is not much difference these days. Cast stoves used to have the edge because any part that failed from heat stress could be replaced. But now, having learned their lessons, the reputable steel stove makers have designed their products so that the highly-stressed internal parts are replaceable. This is one area to watch out for when shopping. Sometimes cheap stoves are not designed for years of continuous winter use, and key parts may be welded in, so it is wise to ask the dealer to show you which parts are replaceable. A few premium stoves are built with soapstone panels in their sides, back and top. The manufacturers of soapstone stoves promote them on the basis that they hold heat for many hours so they level out the inevitable ups and downs in wood stove output. There is some truth to this, of course, but these stoves are also slow to heat up so there is a price to be paid for the heat that they store. Roughly the same effect can be created by building mass into the installation in the form of a stone or brick wall covering and hearth pad. The fact that a stove is built using soapstone is not necessarily a good reason to buy it, unless it also has the other features you want and you really like the way it looks. The debate over catalytic versus non-catalytic combustion has been ongoing for over thirty years. Both approaches have proved effective, but there are performance differences. Catalytic combustion, in which smoky exhaust gases are passed through a catalyst-coated ceramic honeycomb buried deep inside the stove where they ignite and burn, can produce a long steady heat output. All catalytic stoves have a lever-operated catalyst bypass damper which is opened for starting and loading and this, combined with the need for the stove to be burned hot before the catalyst is engaged, tends to make the operation of these stoves a little more complicated. The catalytic element degrades over time and must be replaced, but its durability is largely in the hands of the stove user. With careful use, the catalyst can last more than six seasons, but if the stove is overfired, trash is burned and maintenance is non-existent, the catalyst may fail in as little as two years. Inside a non-catalytic wood stove Inside a catalytic wood stove. As its name implies, non-catalytic combustion does not use a catalyst, but instead creates a good environment for combustion right in the firebox. Three key features create this environment: firebox insulation, a baffle to divert gas flow and pre-heated combustion air introduced through small holes all around the upper part of the firebox. ‘Non-cats’ tend to produce a somewhat peakier heat output curve, but are prized by their users for the arrestingly beautiful fire they create. Good conditions for combustion include high temperatures, so the baffle and some other internal parts will need replacement from time to time as they deteriorate with the heat. So, which is the better stove, a cat or a non-cat? It appeared until recently that the market was slowly turning in favor of non-cats as some mainstream manufacturers actually switched in that direction. But cats are making a comeback, and some of the most popular high-end stoves continue to use catalytic combustion. Both options have their benefits and limitations, as well as legions of loyal users who swear that their (cat or non-cat) is far better than those silly (cats or non-cats). And both burn up to 90 percent cleaner than older conventional stoves. Back in the late 1980s the U.S. EPA established a mandatory smoke emission limit for catalytic wood stoves of 4.1 grams of smoke per hour and for non-cat stoves of 7.5 g/h. The difference in limits is to recognize that cats work great when new (as they are when tested) but the catalytic element degrades with use so by the time the catalyst is due for replacement, emissions are a lot higher than 7.5 g/h. Non-cat performance doesn't tend to degrade as much with use. As a result, you can assume that there is no real difference in the average smoke emissions of cats or non-cats. Today, all wood stoves and fireplace inserts (and some factory-built fireplaces) sold in the U.S. must meet these limits*, and many are certified for emissions down in the 1 to 4 g/h range. The EPA certified emission rate is a reliable number that can be compared from one model to the next. Mind you, a one or two gram per hour difference in smoke emissions is not relevant to the user in the real world of every day home heating. * Some of the cheapest wood stoves on the U.S. market are not EPA certified, but make it to market through a loophole designed to exempt fireplaces from the emission rules. The fireplace exemption says that if an appliance is leaky enough to burn at least 11 pounds of wood per hour (5 kg/h) when its air control is turned down to the minimum, it doesn't need to be tested or meet the emission limits. A few stove manufacturers take advantage of the fireplace exemption loophole by building leaky (non-airtight, ungasketed) stoves and selling them cheap. The trouble is they don't heat worth a hoot because they are uncontrollable and they burn a lot of wood. These are stoves that perform like those sold 50 to 100 years ago. In the old days people put key dampers in the flue pipe to slow down combustion, and now buyers of these cheap exempt stoves are forced to do the same. This, of course, undermines the objectives of the EPA regulation and makes a lot of smoke. Note that at least one manufacturer offers these dirty burning stoves AND flue pipe key dampers for sale on the same web page! Don't make the mistake of buying one of these. You get what you pay for. The far higher efficiency delivered by advanced, certified stoves is definitely relevant in day-to-day use. On average, the new stoves are about one-third more efficient than the old box, pot belly, or step stoves of yesteryear. That’s one-third less cost if you buy firewood, or one-third less cutting, hauling and stacking if you cut your own. Although this higher efficiency is a by-product of mandatory emissions limits, it has made the EPA rules a winner for both the environment and stove users. Unfortunately, none of the really useful performance ratings shown on stove brochures (like efficiency, heat output, heating capacity and burn time) are standardized and regulated, so they can’t be trusted or compared one to the other. For example, the EPA does not require stove efficiencies to be reported but for obscure bureaucratic reasons assigns default figures of 63 percent for non-cats and 72 percent for cats. Some manufacturers have paid for independent efficiency tests and show the resulting figures on their promotional brochures. But because efficiency test methods have not been standardized and regulated, you can’t be sure the figures are based on the same tests and calculations. On the other hand it appears that all EPA certified stoves are over 60 percent efficient and some can deliver around 80 percent of the fuel’s potential heat to the house. This is far better than the low-tech uncertified options, many of which are in the 50 percent range and lower. An overall efficiency higher than 80 percent is not desirable because the resulting low exhaust temperature means weak draft and the risk of water vapor condensation which damages the chimney. Most manufacturers list a maximum heat output in British Thermal Units (BTUs), and for popular stoves this falls in the 25,000 to 80,000 BTU range. But this figure is misleading. First, the full output of a stove should not be used often because continuous high firing can do serious damage to the stove’s innards. Second, the average medium-size house needs only 5,000 to 20,000 BTUs per hour of continuous heating power, even during cold weather. Some manufacturers use the heat output rate from EPA testing, which uses softwood fuel, and others use the results of their own tests using hardwood fuel which can produce a much higher peak output. Another way these figures can be misleading is that non-cats tend to produce a higher peak heat output, but this doesn't mean they'll produce more heat over an eight hour burn cycle, which is a more relevant performance indicator. The result is that you can't compare the heat output of stoves because the ratings are not standardized and can't be trusted. Stove makers always state how many square feet of space the unit will heat. Some of them wisely give generous ranges like 1000 to 2000 sq. ft. or suggest the maximum area the unit will heat. The reason for the big range and vague figures is that a particular stove might heat 2000 sq. ft. in central U.S., but only a 1000 sq. ft. house in central Canada due to the climate difference. Not only that but an old house might have twice the heat loss of a new house of the same size in the same climate zone. Also, if your house is divided into many small rooms, you probably won't be able to move the heat around the rest of the house, so the square footage rating is useless to you. And finally, a stove burning softwood like spruce will put out much less heat per firebox load than it will burning a hardwood like maple. Obviously, heating capacity ratings based on square footage are unreliable. In practical terms, considering all the variables, wood stoves come in only three sizes; small, medium and large. The shape of the firebox affects its useable volume so there can be some exceptions to this very rough guideline. large stoves have a firebox volume greater than 3 cubic feet and are suitable for heating somewhat larger open plan or leakier houses. Of course, all size considerations must take account of your house type, climate zone and standard fuel. 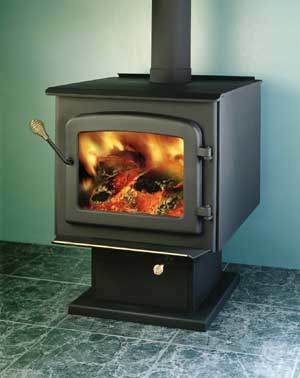 Correct sizing of stoves for particular objectives and conditions is one area where the advice of an experienced wood stove dealer is particularly useful. How long will a given stove burn on a single load of wood? The only reasonable answer is: It depends. Burn time depends on wood species and moisture content, and on how much heat is needed during the burn. My experience is that a medium or large stove sized correctly based on all the issues discussed here will give a reliable overnight burn with enough coals remaining to kindle a fire in the morning. Stoves in the small category may or may not give an overnight burn, but they tend not to be practical for whole-house primary heating. One advantage of catalytic stoves is that the good ones can deliver a lower burn rate over a longer period than non-cats and yet still burn clean. But the disadvantage of these long burn times is that the door glass tends to get dirty at very low firing rates. In other words, a stove that has a claimed burn time of ten hours may not be better or more convenient to use than one that delivers an eight hour burn. Don’t be misled into thinking that a stove that can handle 20 inch firewood is really bigger or better than one that can take up to 18” logs. The standard firewood length for stoves is 16”, mostly because it is the most practical length for handling. Any guy who claims it is easy to lift, stack and load 20” firewood is bigger and stronger than me. I am also aware that women in North America are serious users of wood stoves and I suspect that, on average, their wrist and forearm strength is closer to my own than to a burly logger’s. On the other hand, knowing the maximum log length is useful because for convenient loading, the firebox should be about three inches bigger than your average piece of firewood. There are many other features that you might wish to consider. These include whether the stove has an ash pan, a cooking surface, whether it can be operated open with a fire screen in place, and aesthetic matters like plated doors and trim, pedestal versus legs and color options. None of these affect heating performance but can influence your enjoyment of the stove. The way the logs are oriented in the firebox has a big effect on how they burn and on how much heat the stove can put out over an extended burn. When looking at stoves, take note of how the logs are intended to be oriented. A stove that is oriented east-west has a firebox that is wider than it is deep. Through the glass door you are looking at the sides of the logs. 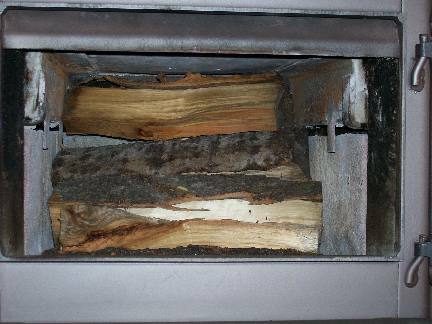 Only about half the firebox volume of an east-west stove can be used because if you load it too full, logs can fall against the glass door. A stove that is oriented north-south has a firebox that is deeper than it is wide. Through the glass door you are looking at the ends of the logs. The full firebox volume of a north-south stove can be used because logs can't fall forward. As a result, a north-south stove has more heating capacity than an east-west stove of the same volume. A firebox loaded east-west. A firebox loaded north-south. The issue of firebox orientation may or may not be something that a dealer might discuss with you, but it is probably more important (along with firebox volume) to your long-term satisfaction with the stove than most of the other factors usually considered when choosing a stove. Note that the stove in the photos above has a firebox with a floor that is roughly square so wood can be loaded east-west or north-south, which is a very nice feature in a stove used for serious home heating.